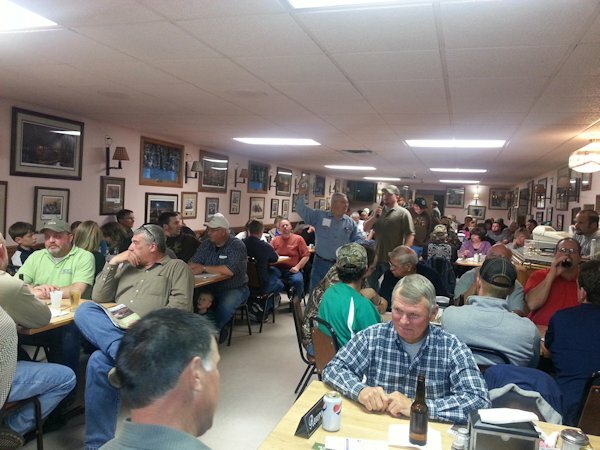 It was a busy place Monday evening at "The Pink" with few idle moments amoung the volunteers who make up the Lomax Chapter of Ducks Unlimited (DU). The passion of the members is to raise lots of funds for DU. The Mission of Ducks Unlimited - filling the skies with waterfowl today, tomorrow and forever, is what it's all about. Ducks Unlimited is the world's leader in wetlands and waterfowl conservation, and for Illinois, a state that was at one time, 70% wetland, the organization is crucial. DU got its start in 1937 during the Dust Bowl when North America's drought-plagued waterfowl populations had plunged to unprecedented lows. Determined not to sit idly by as the continent's waterfowl dwindled beyond recovery, a small group of sportsmen joined together to form an organization that became known as Ducks Unlimited. Its mission: habitat conservation. In Lomax, Harold Ravencraft has made a big contribution and he has now turned the Chairman position over to 6 year member, Steve Isaacson of Carman and his Co-Chair Chris Doran. Isaacson mainly enjoys hunting, deer, but said, "Wetlands and reserves is going to be used by any kind of wildlife. I would like to see the growth and management of reserves and wetlands not only for myself and my generation, but also, for future generations. Hopefully, they will keep it going." Isaacson said the chapter is required to have at least one fundraiser a year and they work to make it big and they only do one a year. Where some years The Pink has been packed with over 250 plus, This year had some open seats. 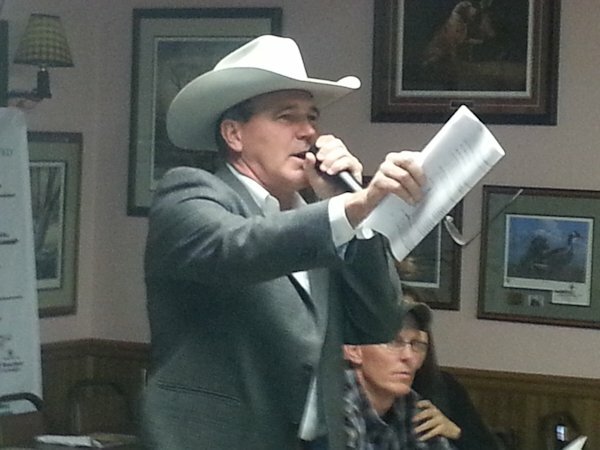 There were 107 registered bidders with wives and children in attendance as well. Brett Brown from Princeton is Illinois' Northwestern Regional Director of one of five DU Regions. He was at the event to oversee, consult, and advise to make sure guidelines are being followed, and to cheerlead the volunteers on. His passion for conservation and the work of D.U. is contageous. "There are thousands of volunteers nationwide and many in Illinois," Brown said. He trains the volunteers all over his Region which includes Rocford, Peoria, Moline, etc. "This little town raises more funds than the large cities in my region." Brown said that Ravencraft would started fundraising on January 1st, by getting sponsors and contributions. "Their fundraising efforts are critical," Brown said. "The money is need in obtaining the matching funds from grants." Now, the Lomax Chapter has a new chair and co-chair and Brown said, "I like to see the enthusiasm in the young guys, like Steve and Chris." "It's fundraising is critical. Over 80% of the money raised goes towards its mission. The Lomax Chapter has probably brought in $350,000 over its 15 years." Brown is proud of Ducks Unlimited's legacy. DU is the world's largest and most effective private waterfowl and wetlands conservation organization. DU is able to multilaterally deliver its work through a series of partnerships with private individuals, landowners, agencies, scientific communities and other entities. 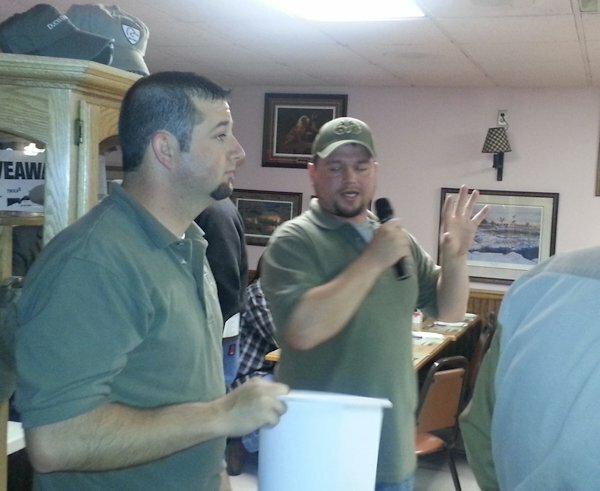 Lomax Chapter of Ducks Unlimited Chairman Steve Isaacson and Co-Chair Chris Doran get ready to draw out a torn card for another prize. Past chair for 14 years, Harold Ravenscraft, owner of The Pink Tavern in Lomax, sells the final card from a deck of 54 . Dan Sullivan auctioned over fifty DU items of all kinds including prints, rifles, duck calls, Decoys, sculptures, bag toss, cutlery set, and many donated items from around the area. Net proceeds exceeded $20,000 in past years.